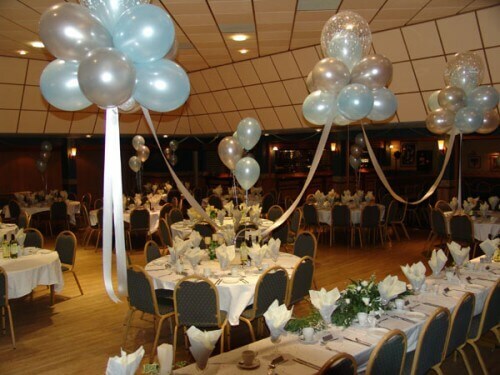 Balloon clouds, often called "Cloud Nine", make a perfect head table wedding decoration. They can of course be used for any occasion, like birthdays, anniversary parties, baby showers, themed parties or corporate events. 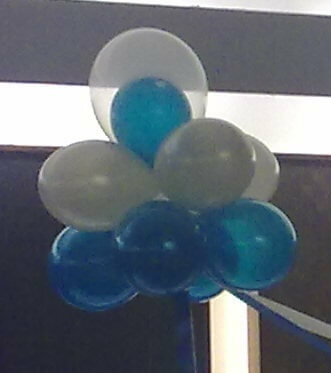 Cloud nine decorations consist of 9 helium filled balloons, arranged together to form a cloud shape. They are topped with a double bubble, usually an 11 inch balloon in a 16 inch clear balloon. They are strung together with ribbons and tulle, in arrangement of three or five clouds, creating the beautiful illusion of floating clouds above your head table! Create a template for your balloons by tracing the outline of a plate or pie tin onto a piece of poster board. The size of the circle reflects the inflated diameter of your balloons. Remove the traced circle with your scissors. As you inflate each balloon, hold it inside the cut-out, filling the balloon until it just touches the sides of the poster board. This way, all of your balloons will be approximately the same size. Alternatively, you can use a home made or commercially available balloon sizer. Fill the first balloon with helium. Tie a knot at the end. Attach a piece of monofilament line 2 feet in length to the tail of the balloon. Place the free end of the line underneath a heavy book. Fill a second balloon and tie a knot at the end. Holding both balloons by their tails, tie them together, forming a duplet which looks like a big bow tie. Now fill balloons number 3 and 4 and create a second duplet. Twist the two balloon duplets together at their centre, forming a balloon four-leaf clover (a cluster of 4 balloons). Repeat Steps 3 and 4, making a second four balloon cluster. Bind this second cluster tightly to the first by running monofilament line through the centre and wrapping it in alternating figure 8s at least three times around each balloon. Be sure to offset the balloons of the second cluster so that they lie in between, rather than directly on top of, the balloons of the first balloon cluster. For the final balloon, you want to make a double bubble. Slip the 11 inch balloon over a chop stick, which makes it much easier to insert it into the 16 inch balloon. Make sure that the necks of the two balloons are aligned before you withdraw the chop stick. Now inflate the outer balloon first and then the inner balloon. The trickiest bit is to knot both necks at the same time without losing too much helium. This is how your finished balloon cloud looks like. Measure the distance from the surface where you will anchor your balloons to their suspended height. Cut a piece of fishing line to fit the distance and tie it to the centre of the cluster on the bottom. Tuck all knots inside the balloon cluster and trim any excess line. Place the balloon cloud cluster in the desired location. Anchor it to the floor or table by tying the end of the line to a heavy object, or securing the end with a piece of strong tape. Now, for the elegant finishing touch, attach your color matching ribbon to the clouds. Have two lengths of the ribbon hang down from the bottom of the cloud, and string one length of ribbon between the clouds, forming a garland to connect the individual clouds into one cohesive decor. Special Tip: Alternatively, non-helium balloon clouds can be suspended from the ceiling by hanging the cloud upside down, with the double bubble at the bottom rather than on top, and attaching the cloud to a ceiling hook. The video below shows how to do this.